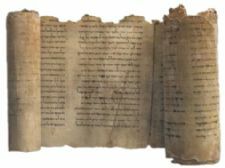 Few if any archaeological finds in the past century have elicited the interest or controversy that has surrounded the Dead Sea Scrolls. With that in mind, Jewish residents of Manchester, England, sat down to learn more about the scrolls, and what they can and cannot tell researchers, from one of the world’s leading scholars on the topic, New York University professor Lawrence H. Schiffman. Schiffman, who serves as chair of NYU’s Skirball Department of Hebrew and Judaic Studies and is a member of the university’s Centers for Ancient and Near Eastern Studies, began his pre-Shavuot address at the Beis Menachem Community Centre by referring to what he called the “mystique” of the scrolls.